When the original CRJ200 took to the sky in 1995, it had one of the smaller cabins for a commercial jet. The Bombardier CRJ200 interior is designed to hold a maximum of 50 passengers, making it one of the smaller jets operated by airlines today. CRJ200 seating is usually configured in a two by two configuration, with two seats on each side of the aisle. 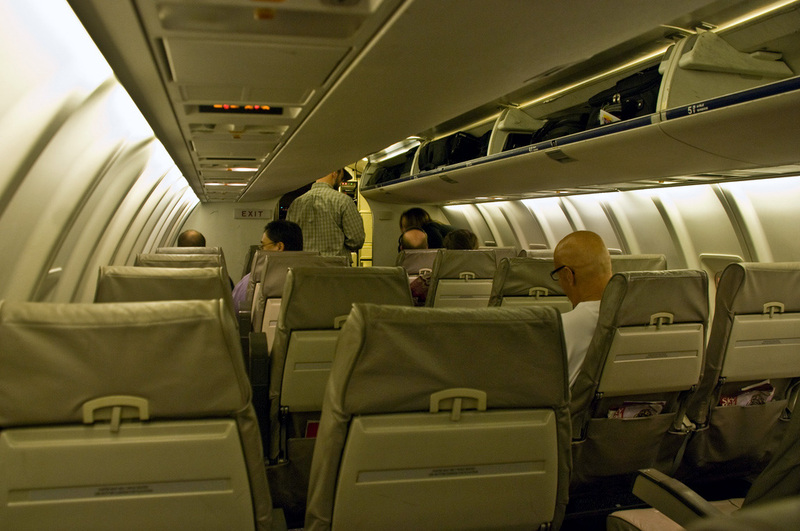 Bombardier CRJ200 seat pitch is 31 inches when there are 50 seats in the aircraft. Just like any aircraft, CRJ200 seat pitch is the measurement from one point on a seat to the same point on the seat in front of it. Though some feel the CRJ200 is small, the Bombardier CRJ200 cabin height is 6 feet 1 inches. The Bombardier CRJ200 cabin door creates an illusion that the aircraft is smaller than it actually is, because it is only 5 feet 10 inches tall and 3 feet wide. The CRJ200 cabin width is 7 feet 2 inches at the floor level and 8 feet 3 inches at the center. In most configurations, the Bombardier CRJ200 is equipped with one lavatory. The Bombardier CRJ200 lavatory - toilet is usually located in the back of the CRJ200 airplane and contains a fully flushing toilet and running water sink. Below is an overview of the CRJ200 cabin dimensions. The Bombardier CRJ200 Interior - Cabin is also known as the Bombardier CRJ-200 Interior - Cabin, Bombardier CRJ 200 Interior - Cabin, Canadair CRJ200 Interior - Cabin, CRJ200 aircraft Interior - Cabin and the Bombardier CL-600-2B19 Interior - Cabin. Above Bombardier CRJ200 Interior - Cabin Photo by PhilipC on Flickr. Photo (only) released under a Creative Commons License.